Is interest expense in P&L equal to the total interest outflow of the company? If not, then how to calculate total interest outflow? Does capitalization apply to inventory as well? Could you please explain to me why the companies capitalise their interest cost to fixed asset? What will be the benefit to companies? Is it to show-off bigger profits to investors? How retail shareholders get affected by this? Interest cost along with other costs of creating the plants/fixed assets like land, building, machinery, logistics etc. are capitalized. The logic is that even though these costs are incurred in the year in which the plant/fixed asset is created, however, the plant runs a longer life and keeps on producing goods for many years. Therefore, the total cost of the plant including the interest cost on the debt taken to build the plant is not recognized as an expense in the profit & loss statement (P&L) in the year in which such costs are incurred. These costs are recognized as a cost in the P&L over the life of the plant as depreciation. The underlying logic of capitalization is that for any year the P&L should have revenue and the cost related to the items which are sold in any particular year. If we show all the cost of the plant as the cost within one year, then it would distort the principle of related recognition of revenue and costs in P&L. As in such a scenario, the cost of the plant, which would have been related to the goods, which it would produce in future, has also been recognized in the current year. Investors should note that recognition of the cost of the plant including the interest cost of the debt taken to build the plant, has no relation to the cash outflow/timing of the cash to be paid by the company for the plant. The costs of the plant including the interest cost need to be paid when they become due: monthly for interest payment and as per terms with the seller for the machinery etc. Cash outflow has no relation to the recognition of cost. The bank would ask for interest payment every month irrespective of the fact that the company might expense this plant in P&L over 10 years. Therefore, investors should estimate the total interest outgo that the company might need to make including the interest which is expensed in the P&L as well as the interest, which is capitalized and then calculate the interest coverage etc. Is interest expense in P&L equal to the total interest outflow of the company? How to calculate total interest outflow? I observed that the in your excel template the interest expense and interest outgo are differing. What is the reason behind it? How are you calculating the Cash + Investment in the same excel? Good morning. How to calculate Interest outgo. What are the parameters used for Interest Outgo? The interest expense in the P&L is net of capitalized interest. Therefore, to calculate the overall interest outflow (including the P&L interest expense and capitalized interest), we have assumed an interest rate of 12% and then calculated the total interest outflow. In the Screener export to excel “Data Sheet”, it provides the data for “Cash & Bank” and “Investments”. We sum these two items in the datasheet to arrive at Cash & Investments. Total debt is also available in the datasheet of the Screener export to excel as “Total borrowings”. You may get the interest rate from the annual report in the detailed notes to financial statements. Thanks for your in-depth analysis. We understand that the companies capitalize the interest and other related costs while setting up a plant or machinery. Is such an application of “capitalization” limited only to plant creation? Or similar mode of treatment can be applied to other “operational expenses “as well, like procurement of raw materials, as indicated in below mentioned hypothetical scenarios. A company in anticipation of a price hike of raw material costs in the forthcoming years accumulates bulk of quantities in advance. However, the realization of lower prices is likely to be at a later stage only. 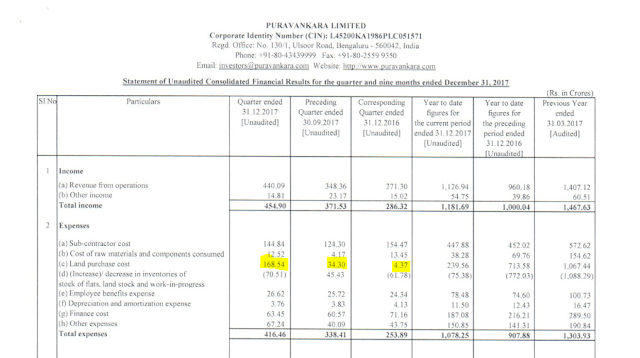 Does the company show such cost in P&L Statement of Account on the same financial year or recognize in Balance Statement, till it realizes (similar to the treatment of CWIP/Fixed Asset)? If the company mentions it as one time cost, does it distort the principle of accounts? 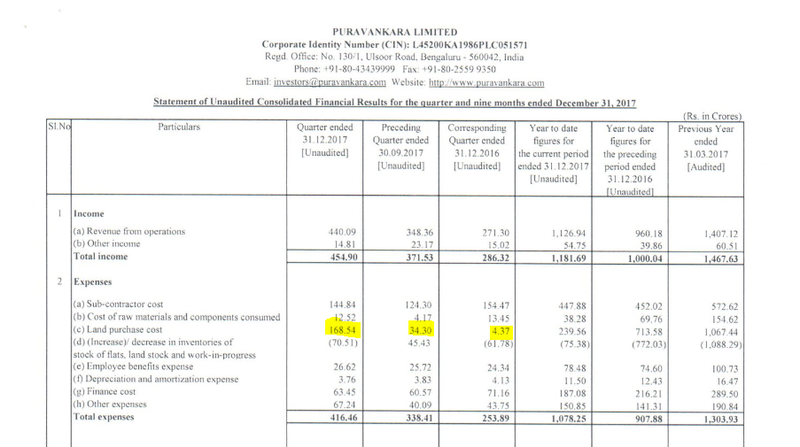 Another instance is that of the recent quarterly result of Purvankara Limited, which shows a substantial increase in the land purchase cost, compared to the previous quarters in P&L Statement (presumably as raw material, considering the kind of business they execute). Does this figure of ₹168 Cr, arrive on account of the transaction carried out during the third quarter or derived from the same principle of capitalization? Appreciate your inputs, when time permits. The concept of capitalization is applicable to fixed assets, which lead to the generation of economic value to the firm for more than one financial year. Such fixed assets include plant & machinery, which once created, keep on producing economic value for many years to come. The concept of capitalization is not applicable to inventory/raw material. The purchase cost of raw material during a quarter is deducted in the P&L during the period it is incurred as “purchase of raw material”. However, if a company has purchased excess inventory than what it could use during the period, then it deducts the purchase cost of such excess inventory from the “purchase of raw material” under the head “increase in inventory” in the P&L. In such cases, you would appreciate that the amount of inventory in the balance sheet increases by the amount, which is deducted from P&L under “Increase in inventory”. This treatment ensures that the purchase cost of only that raw material is deducted from the income, which is used during the period to produce finished goods. In case of the example cited by you, it seems that the land purchase cost is the cost incurred during the reported period. You may also notice the impact of the reduction of “increase in inventory” in the example cited by you. While calculating return on capital employed (ROCE) should be taken CFO (post tax)/ (gross assets+ working capital)*100 as cash flows from operations are not depreciation adjusted. So both denominator and numerator are equal in treatment. As the depreciation is an accounting measure to reduce the tax burden and charges may not accurately picture the life of the asset and its life cycle, shouldn’t this charges be viewed separately and not mixed in calculations all together while calculating different ratios? If cCFO >> cPAT, does it mean that excess cash is advances from customers and if cCFO << cPAT then payments are due from customers? And these differences should match up with receivables and payables. Read: Why Return on Equity (ROE) is not meaningful for Stock Market Investors! Moreover, as stated above, we suggest that investors should keep on tweaking the financial ratios to see if the new measure does a better job. Therefore, we suggest that you work further with CFO as part of ROCE and see if it does a better job. 2) Depreciation is a real expense. It is the adjustment of the cash outflow that the company had in the year of plant setup, however, this cash outflow was not shown in P&L as an expense as the asset would be used for many years. If the investor does not reduce this cash outflow of establishing the plant in the year of plant setup and also does not allow depreciation expense, then the cumulative PAT is going to be grossly inflated. 3) Apart from customer advances, receivables and payables, the CFO is also impacted by inventory and depreciation and other non-operating income & expenses. To understand the relationship between PAT and CFO, I would suggest you read the cash flow statement in the annual report of any company, which would show step by step calculation of CFO from PAT/PBT. This calculation would clearly show how the profits/funds get stuck in or get released working capital and the impact of depreciation. It would be a good learning exercise for you to understand in which cases PAT would be higher than CFO and in which cases it would be lower. In case after reading and analysing the cash flow calculation of company from its annual report, you have any query, then I would be happy to provide my inputs on your analysis and query resolution. I have a query regarding a publishing company Hindustan Media Ventures Ltd. In 2016 Company’s Net Profit was Rs. 197.17 Cr. including Other Income of Rs. 83.89 Cr., which was coming from various Current and Non-Current Investment. Could you please explain, this kind of huge Other Income from investment in Bonds & Mutual Funds is reliable or not? And how much Other Income percentage in Net Profit are acceptable for investment in any Company. Are these worrying signs? And how important is it from investors’ perspective? There is no fixed rule/parameter about the levels of the income from investments (other income) etc. One need to see the level of investments held by the company and then see if the other income is sufficiently explained by the level of investments. For example, if a company has ₹1000 cr. in current investments and the general interest rate prevailing in the economy is about 10%, then an investor should expect that it should have about ₹100 cr. (₹1000 cr. * 10%) as other income. There is no such benchmark level about other income being a percentage of net profits. An investor should keep it in mind that the company should not hold cash unnecessarily for long periods of time. The company should either deploy the cash for future growth opportunities or return it to shareholders by dividend/buyback or repay the debt if it has.